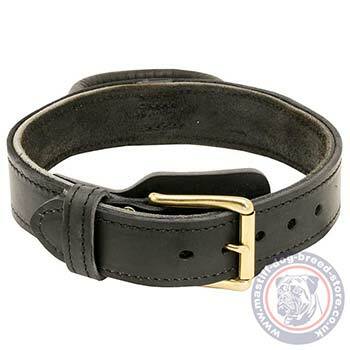 Try a strong 2 ply leather dog collar for mastiff training and walking. Colors: black and brown. Sizes: 17-40 in (43-100 cm). 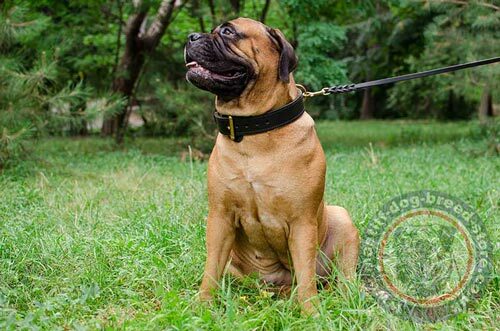 Bullmastiff dog collar choice should be based on such qualities as durability, strength, quality of materials and comfort for you and your dog. 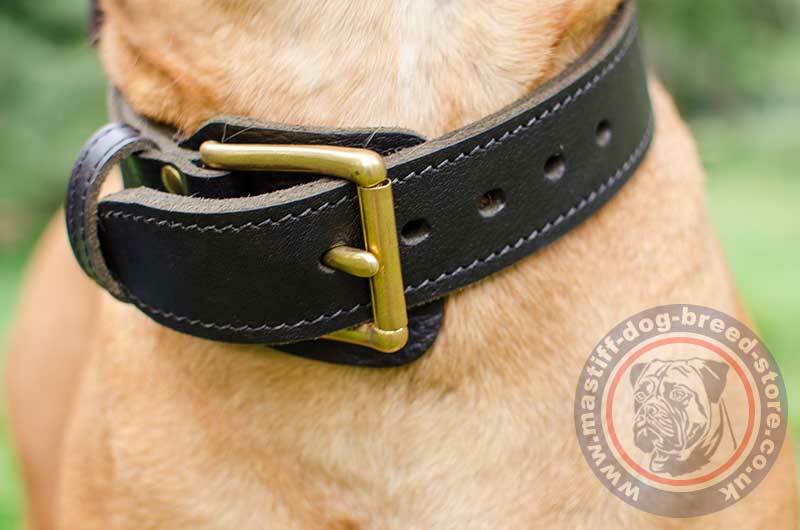 Our specialists designed an extremely strong 2 ply leather dog collar for big mastiff dogs like Bullmastiff. This big and strong dog collar is amde of thick genuine leather, that is reliably stitched. The joints are additionally riveted for the best durability. Strong leather dog collar is equipped with a brass buckle and solid D ring for a dog lead adjusting. Regulation of size is available with a buckle and 5 holes for fixation. 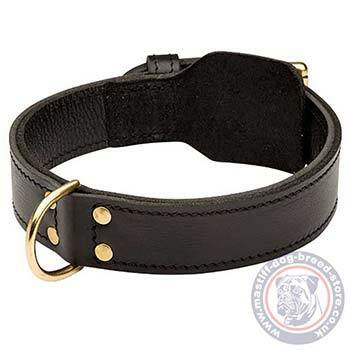 It allows to use this leather dog collar while your dog is growing. Choose 2 ply leather collars and padded leather dog collars size 1 inch bigger to make sure that it will fit your dog. 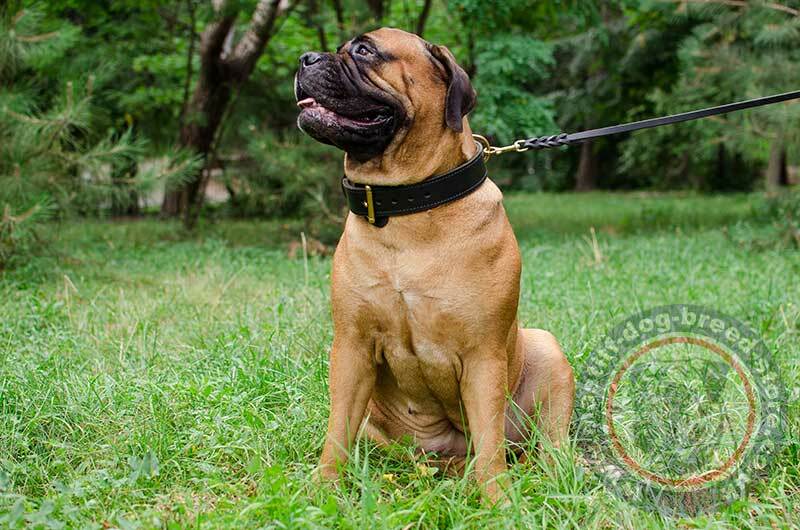 Our Bullmastiff supplies are made of ecologically safe materials. These leather dog collars are absolutely safe for dog’s health. We use only quality genuine leather, that is well done and oiled to make its use reliable and look attractive for a very long-term of regular use. special super strong, cast D-ring for leash attachment, which will help you to control your strong dog better and manage its temper. strong brass buckle, that will help to fix a dog collar maximum comfortably on your pet. the buckle is covered by a soft leather plate inside for fur and dog neck protection. 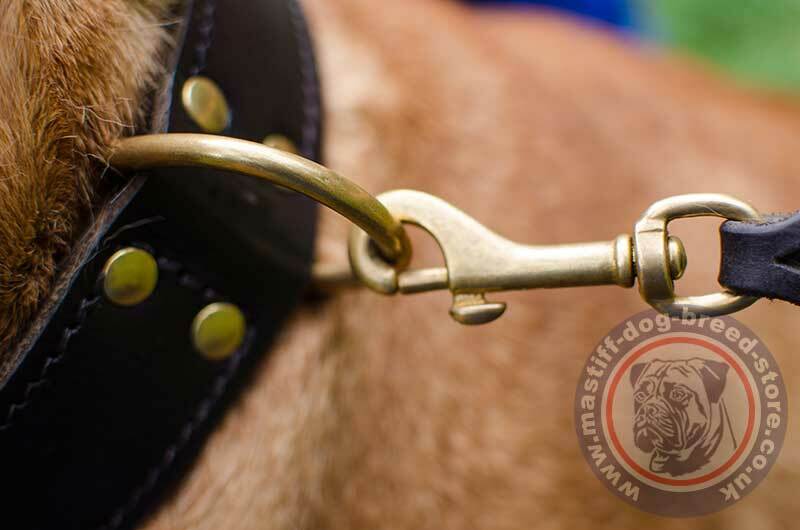 safe polished, rustproof brass rivets for additional super strong fixation of this leather dog collar. It is adviced to take special care of leather dog collar and other leather items to make it look and serve you much longer. All leather dog collars have the International Quality Certificate.